Hands down the most fun Stakes Day to date! The atmosphere was electric, the weather - perfect, the fashion - incredible and the company - always fabulous. 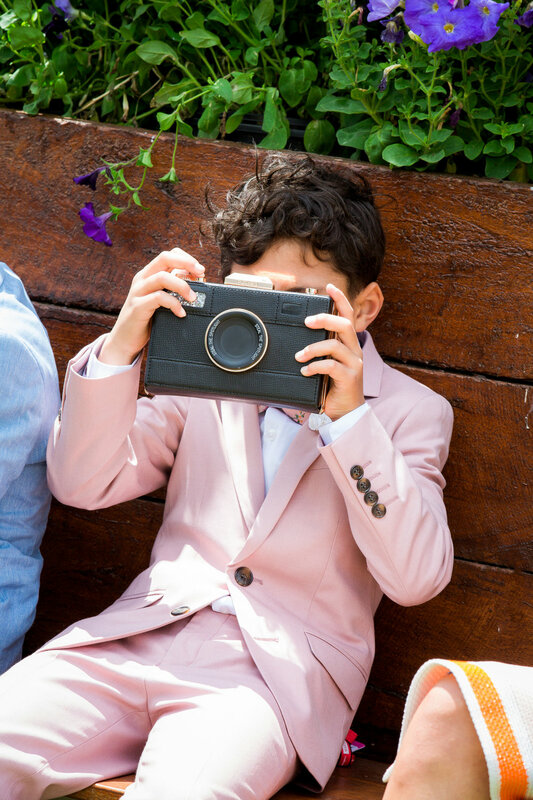 We have lots of snaps to share (thanks to the incredible Lisa Frieling) and a few funny moments too, but first lets chat Fashion! Congratulations to all the stylish entrants, it takes a lot of courage and nerve to get up on stage, and you all did so with such poise and charisma. The 2018 honour roll reads …. Family Category Winner: The Christian family. This year’s colour scheme - pastels - is going to be hard to beat! I’m already throwing in the towel for 2019 because what could possibly top gelato flavoured boys? 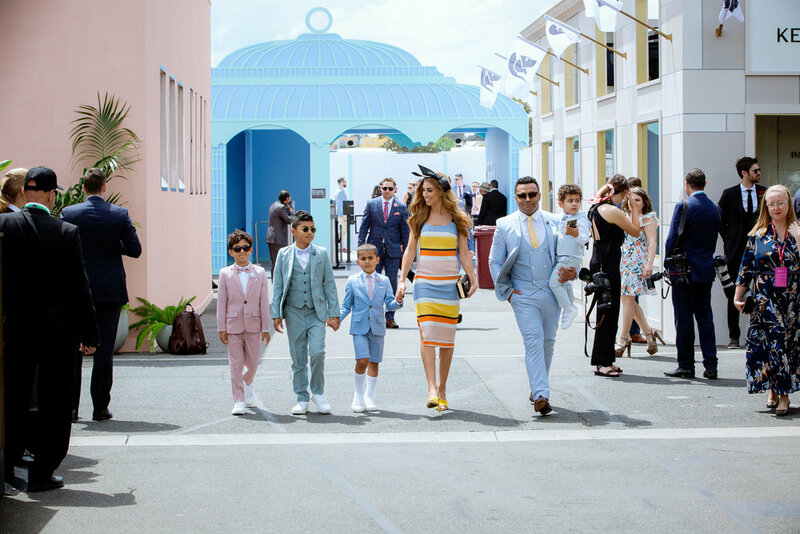 The sorbet tones complimented their complexions beautifully and the birdcage enclosure was also suitably filled with soft pinks, blues and yellows. It just all worked! 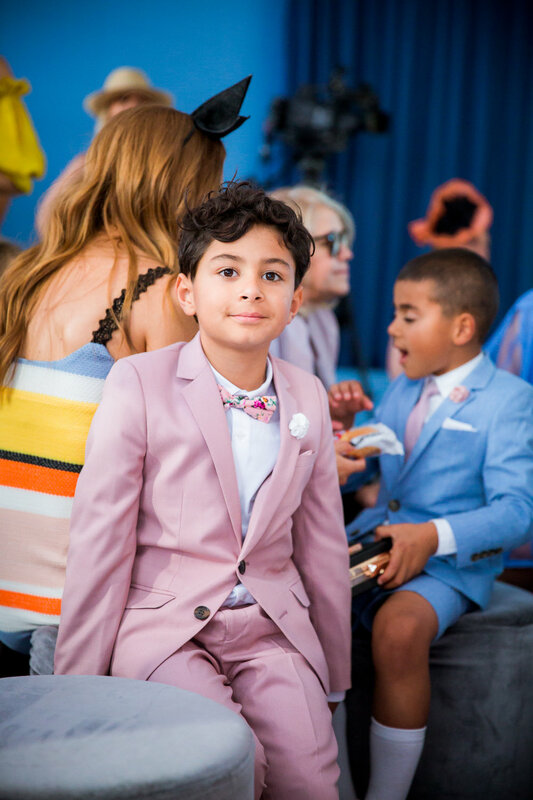 My older three boys wore River Island suiting, purchased way back in April when SS18 first dropped in the northern Hemisphere! It was a risky move, predicting the correct sizes of 3 growing boys 8 months in advance, but mum knows best (wink wink) …well, with the exception of Tevita’s blazer! ha ha. 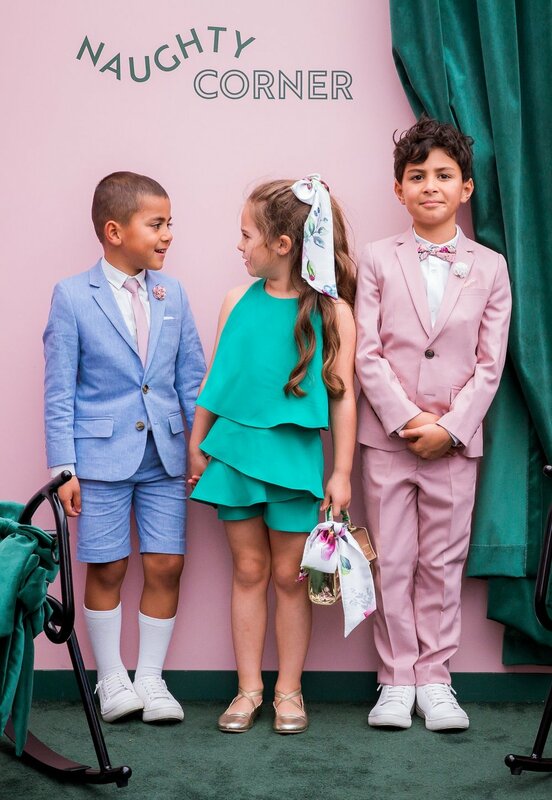 If you too have a pastel obsession, you can shop their suits now on SALE starting at a tiny $20 a piece! Very limited sizes remain, so move fast as they won’t last much longer! Shorts are available as a option in all colour ways too. We accessorised with lapels by Politix, ties and chiefs from Roco Clothing and River Island. His effortlessly cool white leather hybrid sneakers were also from Roco Clothing. I wore Myer accessories - Olga berg millinery, Olga Berg camera clutch and Tony Bianco heels. My dress was incredibly comfy and very summer, the Lacework Strap Midi is By Johnny. A day out at the races with 4 kids in tow requires supplies, so David’s trusty old leather backpack came along with us. It was full of snacks, nappy change essentials, blister pads, bandaids, spare jocks (don’t ask), spare socks (yes really), tissues, toys and other miscellaneous items require to tame/sedate a busy toddler. What we didn’t prepare for was the ‘no bags left unattended’ protocol that was in full force inside the Birdcage. 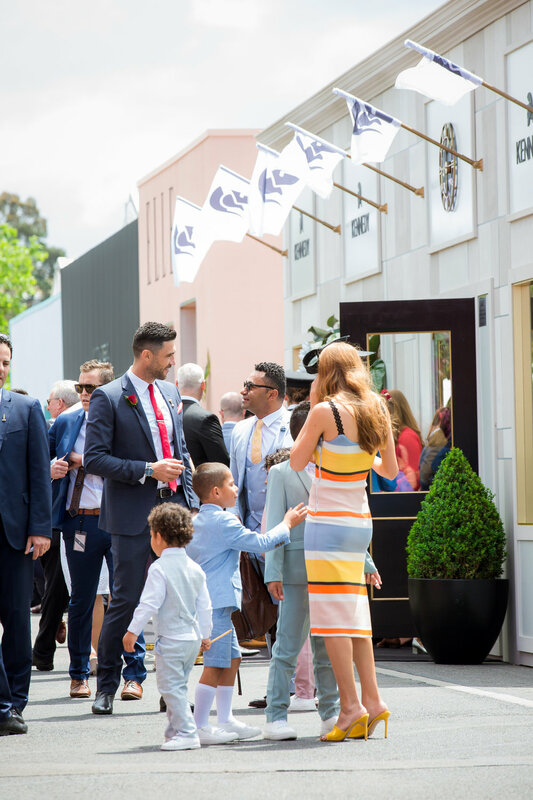 Given the Bourke St incident unfolded the night before, security was heightened on Stakes Day. Metal detectors scanned in attendees (a first for carnival) and a heavy security presence was felt. While attempting to nail the perfect family shot we decided to ditch the backpack off to the side. However, little Salesi (who is going through a possession-obsession stage), wouldn’t have it and continued to retrieve our backpack and drag it back into frame. We eventually hid the bag out of sight, so much so, we completely forgot about it! It was nearing midday and I had to report for FOTF judging duties, so we made our way back to the buggy pick up point. It was at that moment (when we required our accreditation passes to exit) that I realised we were missing our backpack! David raced back to the secret spot, but the bag had vanished! A nearby security guard informed us that the security team had moved on it! After a few laps of the birdcage, and a countless radio messages between security teams, our trusty old backpack was returned (unharmed) much to Salesi’s delight…and my relief! One of the finest and funniest moments of the day goes to a little lass who is no stranger to the limelight - Lady Penelope Merrington. This little pocket rocket is the daughter of Yummy Mummy royalty Lorinska, and at 2 years of age, is no wall flower. As Lorinska sat on the judging panel, little miss P (under the very close supervision of dad…ha ha!) made her way up onto the stage to join the 6-12 year old entrants in the Junior Girls category! Not only did she walk the walk, she also attempted to talk the talk, stealing emcee Kris Smith’s microphone. It was a highlight captured beautifully (in real time) by her mortified mummy. Check out Lorinska’s Insta post here for the footage - so hilarious.